Medtronic, PayPal, Southworks, and Microsoft recently worked together to demonstrate the ability for people to use their PayPal identities for participating in a Medtronic medical device trial, rather than having to create yet another username and password. 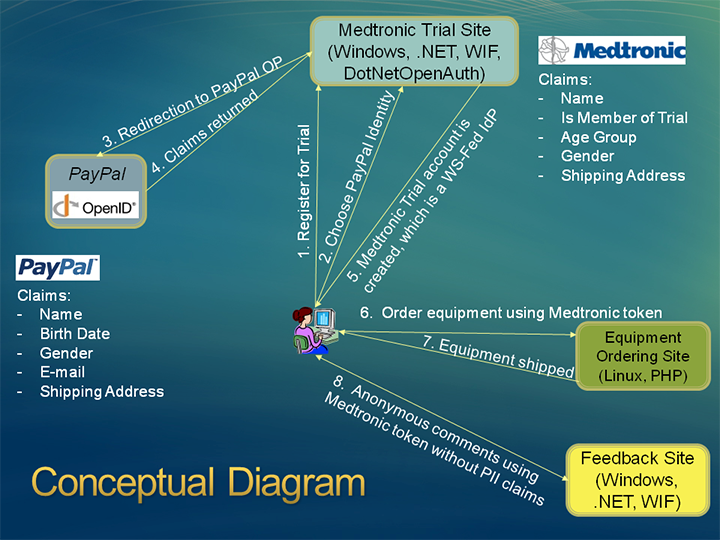 Furthermore, the demo showed the use of verified claims, where the name, address, birth date, and gender claims provided by PayPal are relied upon by Medtronic and its partners as being sufficiently authoritative to sign people up for the trial and ship them the equipment. I showed this to many of you at the most recent Internet Identity Workshop. We called the demo an “identity mash-up” because Medtronic constructed a identity for the user containing both claims that came from the original PayPal identity and claims it added (“mashed-up”) to form a new, composite identity. And yet, access to this new identity was always through the PayPal identity. You can read more about the demo on the Interoperability @ Microsoft blog, including viewing a video of the demo. Southworks also made the documentation and code for the multi-protocol STS available. I’ll close by thanking the teams at PayPal, Medtronic, and Southworks for coming together to produce this demo. They were all enthusiastic about using consumer identities for Medtronic’s business scenario and pitched in together to quickly make it happen. Update: Also see related posts by Kim Cameron and Matias Woloski. Microsoft has published the first of a series of step-by-step guides on configuring AD FS 2.0 to interoperate with partner products. This guide describes how to configure AD FS 2.0 and CA Federation Manager r12.1 to federate using the SAML 2.0 protocol. The guide is available in HTML and Word format. Thanks go to author Dave Martinez for his expert and detailed treatment of the topic.